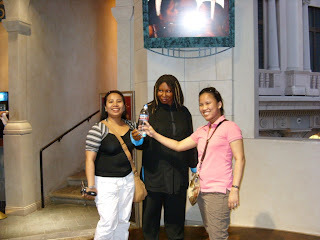 After picking up my sister yesterday at her work place, we just did some errands and proceed to the strip in Las Vegas. That was already around 6pm. It is not dark at that time. 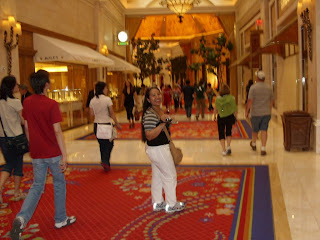 Las Vegas is really a fabulous city, a fascinating one. I just admired the way it is being so developed. Las Vegas, the city that never sleeps...the city that offers world class entertainment..whatever fun you want..you can find it here! of course my day of touring is not enough without hundreds even thousands of pictures being taken...yesterday alone i got around 1,500 pictures...amazing!! please visit my other blogs for more updates!! inside Wynn, amazing hotel casino and a shopping mall...really amazing how this building is made...will post more pictures in the next few days! who's this artist anyway!! forgot here name....leave some comment for me please!! sorry im still tired from last nights escapades!! i'm still feeling so sleepy till now!! on our way to Mirage!! another casino hotel!! 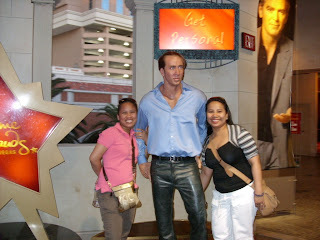 together with my boyfriend, Nicolas Cage...bwahaha!! aminin! !